The surprising discovery of a supermassive black hole in a small nearby galaxy has given astronomers a tantalizing look at how black holes and galaxies may have grown in the early history of the Universe. Finding a black hole a million times more massive than the Sun in a star-forming dwarf galaxy is a strong indication that supermassive black holes formed before the buildup of galaxies, the astronomers said. The galaxy, called Henize 2-10, 30 million light-years from Earth, has been studied for years, and is forming stars very rapidly. Irregularly shaped and about 3,000 light-years across (compared to 100,000 for our own Milky Way), it resembles what scientists think were some of the first galaxies to form in the early Universe. "This galaxy gives us important clues about a very early phase of galaxy evolution that has not been observed before," said Amy Reines, a Ph.D. candidate at the University of Virginia. Supermassive black holes lie at the cores of all "full-sized" galaxies. In the nearby Universe, there is a direct relationship -- a constant ratio -- between the masses of the black holes and that of the central "bulges" of the galaxies, leading them to conclude that the black holes and bulges affected each others' growth. Two years ago, an international team of astronomers found that black holes in young galaxies in the early Universe were more massive than this ratio would indicate. This, they said, was strong evidence that black holes developed before their surrounding galaxies. "Now, we have found a dwarf galaxy with no bulge at all, yet it has a supermassive black hole. This greatly strengthens the case for the black holes developing first, before the galaxy's bulge is formed," Reines said. Reines, along with Gregory Sivakoff and Kelsey Johnson of the University of Virginia and the National Radio Astronomy Observatory (NRAO), and Crystal Brogan of the NRAO, observed Henize 2-10 with the National Science Foundation's Very Large Array radio telescope and with the Hubble Space Telescope. They found a region near the center of the galaxy that strongly emits radio waves with characteristics of those emitted by super-fast "jets" of material spewed outward from areas close to a black hole. 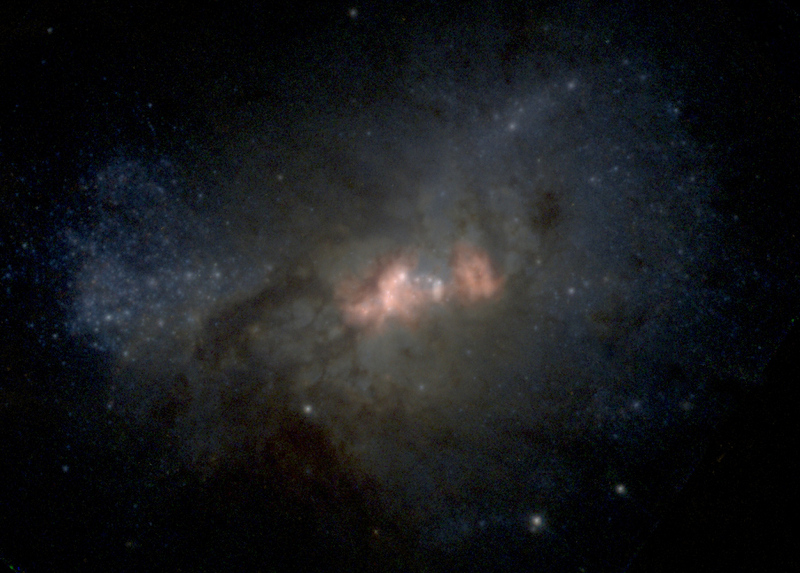 "Not many dwarf galaxies are known to have massive black holes," Sivakoff said. While central black holes of roughly the same mass as the one in Henize 2-10 have been found in other galaxies, those galaxies all have much more regular shapes. Henize 2-10 differs not only in its irregular shape and small size but also in its furious star formation, concentrated in numerous, very dense "super star clusters." "This galaxy probably resembles those in the very young Universe, when galaxies were just starting to form and were colliding frequently. All its properties, including the supermassive black hole, are giving us important new clues about how these black holes and galaxies formed at that time," Johnson said. The astronomers reported their findings in the January 9 online edition of Nature, and at the American Astronomical Society's meeting in Seattle, WA.